The object was to be the first player to successfully roll and move their cat-shaped playing piece around the game board’s picket fence and back to the doghouse. Muggs, the Motorized Mutt, impeded their progress. Powered by two AA-batteries, Muggs was activated for short periods through the roll of the dice, when he would randomly smash and crash into the fence. If he knocked a cat off its perch, the player was forced to move the playing piece to the nearest barrel, which was considered a safe spot on the game board. 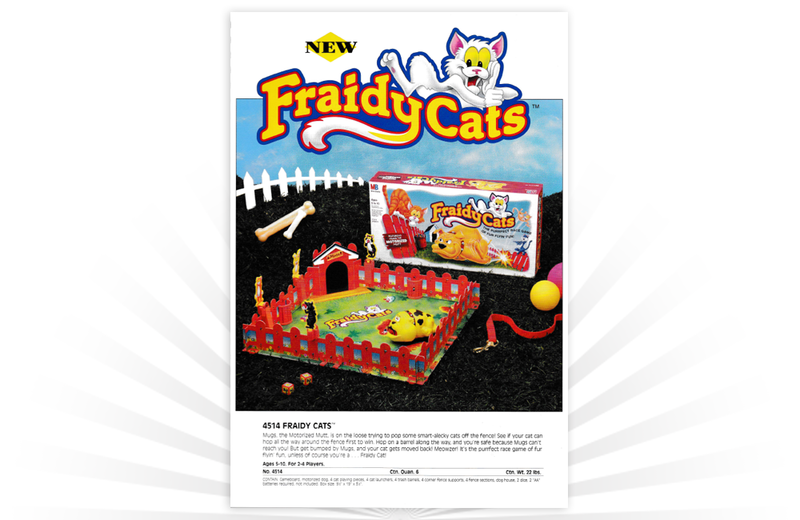 In addition to the gameboard, FraidyCats came with a motorized dog, 4 cat playing pieces, 4 cat launchers, 4 trash barrels, 4 corner fence supports, 4 fence sections, a dog house, and a pair of dice. "Simon is waiting for you." A vintage ad from 1968 for the Suzy Homemaker line of miniature toys from Topper Toys.